Boil the spaghetti. In a bowl shred feta cheese, add chopped peppers and the corn, and also salt and pepper to taste. Stir all together. Fried the onion and the minced (or sausages) in a deep pan and put the tomato paste above. 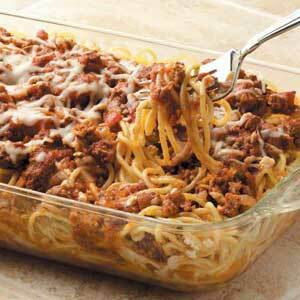 Put 1/3 of the spaghetti in an oiled baking dish, and then add the mixture of cheese, peppers and corn. Then add the next 1/3 of the spaghetti and then the mixture of onion, minced and tomato paste. Add the last 1/3 of the spaghetti above and then grate the yellow cheese and dust with savory. Bake in an oven until the yellow cheese is getting gold.